Municipal bond rates are at historic lows. A memo by two respected faculty members at the UCLA Anderson Forecast (available at Streetsblog, for some reason link to city website is broken) suggests the city take advantage of these low rates to fund a $3 billion program to resurface, rehabilitate, and reconstruct city streets. This same logic extends to any local investment activity – because rates are low, it’s a good time to build or repair anything the city will need in the future. Street repair is an especially good choice for a city experiencing an historically high unemployment rate because a higher proportion of street investment goes into labor and wages than for other investments, a subway tunnel for instance. ...does a gas tax, or a mix of user fees, make more sense to fund road repair than a property tax increase? While the UCLA Anderson Forecast memo connects street quality and property values, assessing street repair bonds on property tax bills disconnects the payers and the beneficiaries. Although the street improvements, like any increase in amenity value, will be capitalized into slightly higher housing prices, the primary beneficiaries will be drivers who enjoy a smoother ride and reduced vehicle maintenance costs. These drivers need not live in the City of Los Angeles to benefit. Those Los Angelenos who do no or little driving will be assessed the same amount as those who drive fully-loaded Humvees. Even lower income renters who rely on transit and walking will absorb some of the property tax increase. These are some of the many reasons that policymakers have used user fees to generate revenues for transportation. This century-old system of user fees was born in Southern California. The belief at the time was that asking those who purchase cars and use gasoline to fund roads would be fair and equitable. The gas tax served the transportation system well, until increased vehicle fuel economy and inflation eroded its purchasing power. 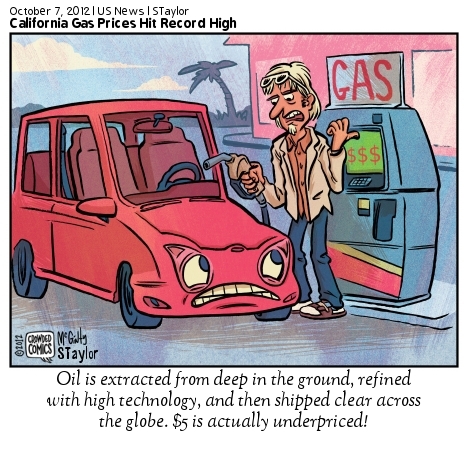 Californians pay the same nominal tax on a gallon of gasoline as they did in October, 1993. However, a dollar spent on state and local investment in 1993 is only worth 57 cents today. participation in a regional VMT fee, congestion pricing system, or gas tax supplement, with a local return to the city. Implementing any of these user fees will take years, so the city can’t rely on them to issue bonds today. Even if it did, the revenues from such measures would be far more uncertain than future property tax receipts, translating to higher interest rates and less investment..
One option the city should consider is a hybrid: pursue a property-tax backed street repair bond now in order to take advantage of low interest rates. Later, after the city implements measures to increase revenues from transportation system users, it should use some of these funds to offset a property owner’s tax assessment. The greater the user fee revenues, the lower a property owner’s tax assessment will be. Such a plan creates a large, powerful constituency for a long-term, sustainable transportation finance options, while still taking advantage of historically low interest rates. Additionally, increasing the marginal cost of driving will make competing modes relatively more attractive – creating additional demand for biking, walking, transit, and increased vehicle occupancy. When investing in its streets, Los Angeles should look forward to serve the future needs of residents who use all modes, not just the historical needs of those who are passing through. That means the bond’s expenditure plan must include considerable set asides for sidewalk repair, pedestrian markings, cycle tracks, parklets, and the accelerated implementation of the bicycle master plan. After all, at least initially, it’s residents who will be investing in the streets, not drivers. Spending less than 25% of the bond’s proceeds on active modes and recreation would be a huge windfall for out-of-town drivers at the expense of Los Angeles residents. Spending anything less than 25% on such programs ignores Los Angeles’s regional competitive advantage as a city with many walkable neighborhoods. A mother with a stroller who can’t traverse the sidewalk to a charming neighborhood cafe may be better off leaving the city – especially if she’s asked to pay more to smooth roads for out-of-towners who wish to drive to her neighborhood’s charming cafe. Those Los Angeles residents seeking smooth streets in lieu of a walkable neighborhood have far more residential choices than someone seeking a walkable neighborhood outside of the City of Los Angeles. Neighborhood walkability is an amenity that few post-war Southern California communities can offer, and walkability is increasingly being capitalized into housing values. The benefits of the set-aside investment will be captured by all neighborhood property owners, not just those who drive. Juan Matute is a transportation and land use systems researcher at UCLA. He has an MBA from the UCLA Anderson School of Management. He’s the Board President of the Southern California Streets Initiative, the non-profit organization that maintains Los Angeles Streetsblog. The opinions expressed in this article are his own, and do not necessarily reflect those of UCLA, Los Angeles Streetsblog, or any other organization. Another option would be to wait for the Democratic super-majority in the State legislature to pass an amendment to the more than 2/3 voter approval requirement to pass a tax increase and then put another inititative to extend Measure R before the voters. Then, the LA city council could borrow against this future revenue by issuing bonds to pay for both road and sidewalk repairs. Dennis – sales taxes have the same beneficiary-payer disconnect and make the poor worse off than most other forms of taxation. It’s an option, but I see it as even less attractive public policy than purely property-assessed street bond. It will cost the residents of the city of Los Angeles more if a property tax is not imposed to pay for street repair. TRIP estimated that it cost drivers in Los Angeles $746 more in vehicle costs per year to drive on streets in poor condition. The wear and tear on transit buses and lower fuel mileage increases the liklihood that the MTA will need to raise ticket prices. Dennis – it may cost those residents who do drive more, but it will cost those residents who don’t drive less. The TRIP estimate is gross and unrefined. I see it as an overestimate. It would likely manifest not as an increase in maintenance expenditures, but as accelerated depreciation (in non-accounting sense) of vehicle suspension systems. A Federal Highway Administration study concluded that for each $1 billion of federal spending on highway construction nationwide nearly 28,000 jobs are generate annually, including approximately 9,500 in the construction sector, approximately 4,300 jobs in industries supporting the construction sector, and approximately 14,000 other jobs induced in non-construction related sectors of the economy. They also estimated that each dollar spent on road improvements results in an average benefit of $5.20 in the form of reduced vehicle maintenance costs, reduced delays, reduced fuel consumpton, improved safety, reduced road maintenace costs and reduced emissions as a result of improved traffic flow. Using this FWHA calculation, the $3 billion in road reconstruction work would bring $15.6 billion in benefits minus the interest paid on the bond. Poor roads does create more vehicle maintenance in the form of destroying tires and suspensions. If you view the video of the city council meeting regarding this bond measure last Wednesday you will see a Neighborhood Council representative stating that road conditions created a $2,200 repair bill on her small car. My apartment manager had to replace a tire from hitting a pothole in the alley way. These are two examples, but a fair respresentation of what happens when driving on roads in poor condition. I also recall that about a year ago a lawyer who is a coworker of Mayoral candidate Kevin James blew a tire on Hollywood Blvd after hitting a pothole. The Federal Highway Administration did testing which indicated that a 10% decrease in road roughness led to a 4.5% increase in fuel savings. That alone is about $97 per year less in motor fuel costs–at current average fuel prices–for every household in the city LA that uses a motor vehicle. This also would increase MTA bus mileage also as a result lower this agenciesw operating cost. A sales tax does not disproportionately affect the poor. There is no sales tax on unprepared food, transit and housing. These expenses take up the majority of the income of the poor. And who is on the board of TRIP?